International Journal of Research in Health Sciences,2015,3,1,191-198. 1ASSOCIATE PROFFESOR OF OBG , GUNTUR MEDICAL COLLEGE , GUNTUR, A.P, INDIA. 2ASSISTANT PROFFESSOR OF OBG ,GUNTUR MEDICAL COLLEGE , GUNTUR, A.P, INDIA. 3PROF AND HOD OF OBG, GUNTUR MEDICAL COLLEGE , GUNTUR, A.P, INDIA. 4SENIOR RESIDENT , DEPT OF OBG GUNTUR MEDICAL COLLEGE , GUNTUR, A.P, INDIA. 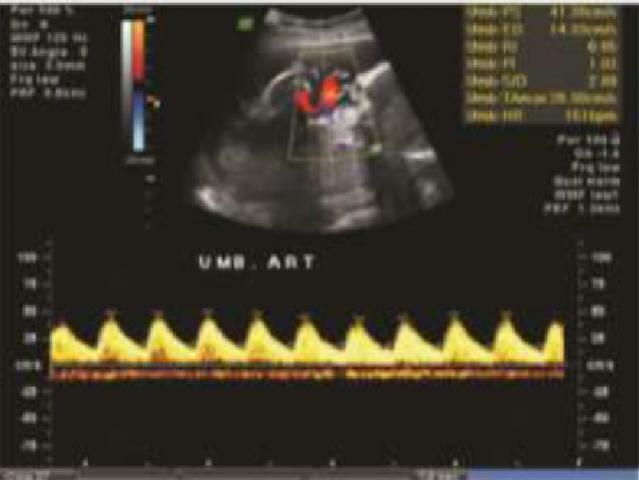 Objective: To study the significance of doppler in PIH and IUGR using middle cerebral artery and umbilical artery blood flow and to analyze the role of doppler in predicting perinatal outcome in PIH and IUGR Methods: The study comprised of 100 women with singleton pregnancies with vertex presentation between 28 to 40 weeks of gestation complicated by preeclampsia and IUGR admitted to Government General Hospital from January 2013- September 2014 studied for umbilical artery and middle cerebral artery Doppler waveforms. The perinatal outcome results were documented and analyzed statistically using percentage and Chi-square test. Results: In our study amongst the umbilical artery wave forms highest LSCS for fetal distress 57%. Umbilical artery PI has highest sensitivity 82.2%. for detecting IUGR. Umbilical RI also had a 100% sensitivity in predicting APGAR<7 at 5min. .Five cases of 100 had AEDF and 3 had REDF. Perinatal mortality was worst amongst the REDF group wherein all delivered stillborn foetuses. Amongst the MCA indices abnormal S/D ratio had the highest specificity of 96.8% for predicting NICU stay>48 hrs. Perinatal mortality was highest for abnormal PI (41.8%) when compared to 34% (abnormal RI) and 31% (abnormal S/D). LSCS for fetal distress was highest, 30.2% amongst the abnormal PI group.. In Perinatal mortality rate was 31.5% in those with a CPR <1.08. CPR had 100% specificity in predicting NICU stay >48hrs and 100% sensitivity predicting fetuses with APGAR<7 at 5mins. Specificity of CPR was 90% in determining NICU admissions. Overall in predicting foetal outcome UA PI has high sensitivity 82.2% in predicting low birth weight. In predicting adverse foetal outcome CPR has highest sensitivity 90%, specificity 86.0% and positive predictive value 94% and accuracy 91%. Conclusions: Pregnancy induced hypertension and IUGR is associated with significant fetal morbidity and mortality. Overall highest CPR had the highest sensitivity 90% positive predictive value 94% and accuracy 91% in adverse foetal outcome .umbilical artery PI has highest sensitivity 83.6% for IUGR. Colour Doppler study is a simple, quick, non -invasive procedure and is found to be the most accurate among the other tests for antepartum fetal surveillance.